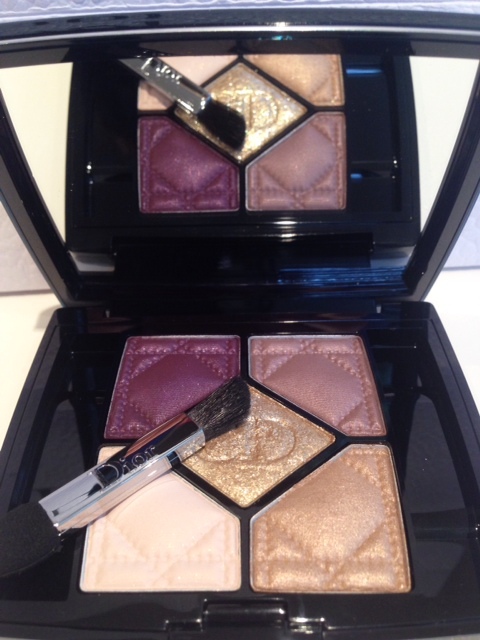 Some serious treats coming our way for Dior Christmas Beauty 2014! The look is called Golden Shock so it’s no surprise that the range focusses on shimmering golden facets – there is a LOT of shimmer! 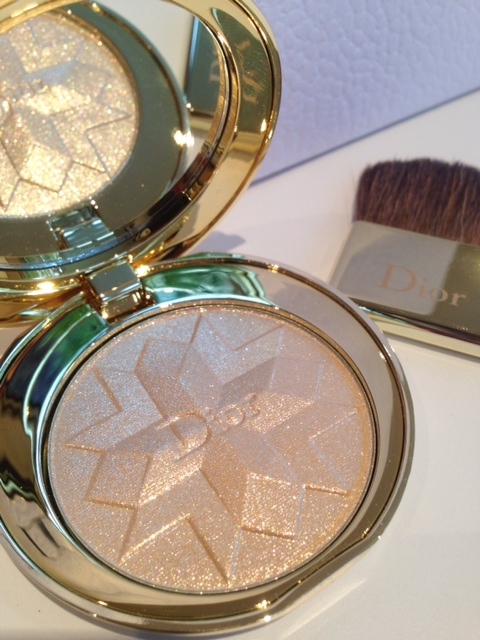 Dior Golden Shock Pressed Powder (£49) is an illuminating powder and also comes in a pink-gold shade and is designed to be used on the temples, nose and cheekbones. Personally, that’s a complete no-no but illuminating powders look stunning in the hair. The Dior Pressed Powder comes with it’s own wide, flat brush so you can literally stroke it over individual strands or even just at the very tips – I promise it looks amazing at the very ends of a high pony. 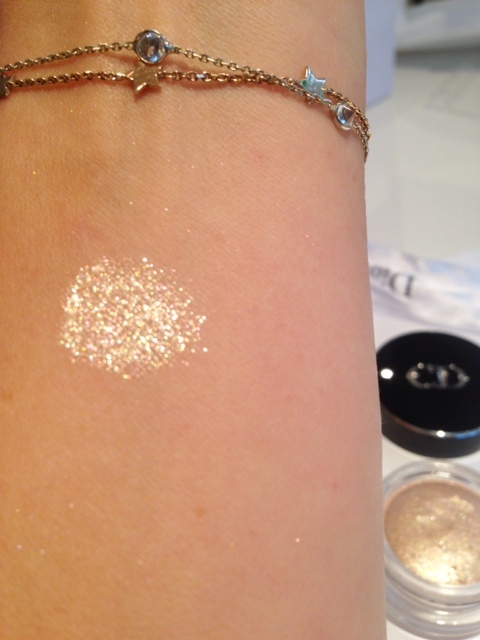 If the illuminating powder isn’t gold enough, Mirror Fusion Mono is off the scale! 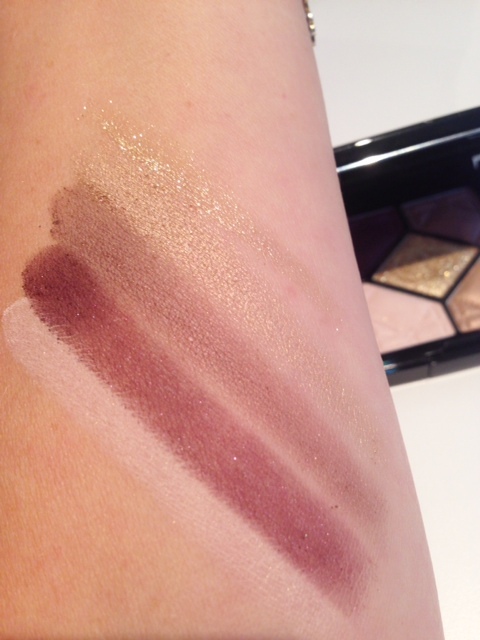 Mirror (£24) is probably the most shimmery product I’ve ever swatched. 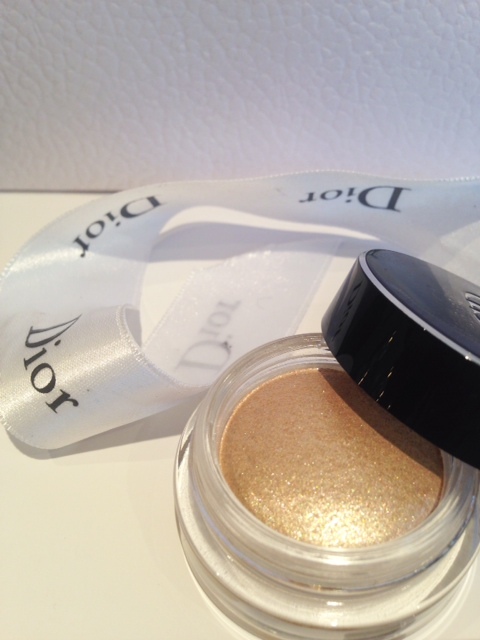 The shade is more of a white gold than a golden gold – it’s just beautiful and if you can only pick up one product from Dior Christmas Beauty 2014, make it this one. 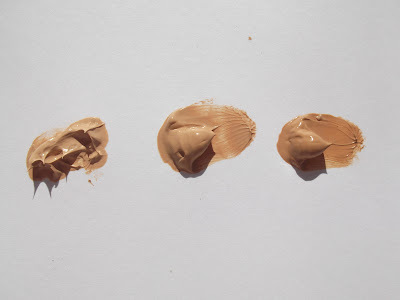 You can use it alone as a full lid shade, line a darker shade or use it as a twinkling wash over any other colour. 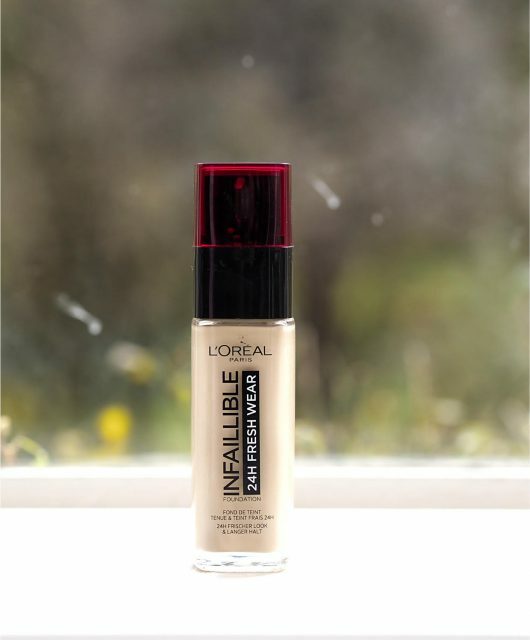 Totally versatile and completely glamorous. 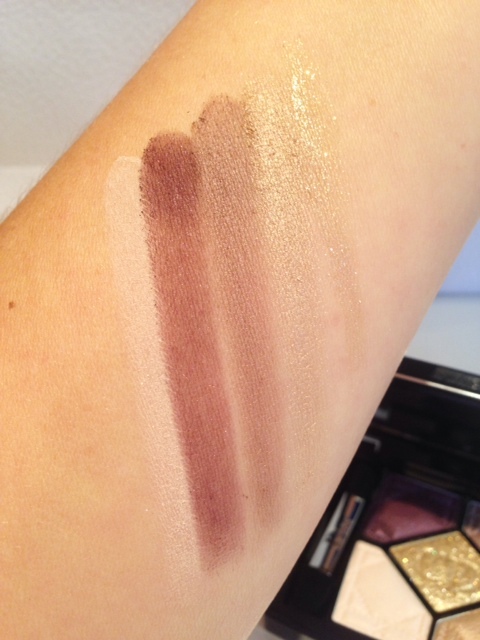 There are two new 5 Couleurs Palettes (£42) – pictured above is Golden Shock (the other, which I don’t have is Golden Reflections – very metallic and darker in tone). The colours are a surprise in the swatching – I’ve used one stroke so you can build the intensity but the purple hues are more of a marron shade – somewhere between purple and brown. I absolutely love them – they’re so different and stunning on any eye colour – I cannot wait to get the deep colour on my eyes! The central diamond is super-glimmery and looser in consistency than the powders so you can ‘wash’ it or press it for a denser golden effect. The first shade, a pinkish white has light sparkle, too, but the rest doesn’t – anything you see in the picture is left over from Mirror, and believe me I have cleansed and washed my arm before starting over! In Part 2 of Dior Christmas Beauty 2014, I’ll be looking at Lips and Nails. The collection launches on 29th October. I know it’s a Christmas collection but why so much gold? What about people that don’t really suit that colour? 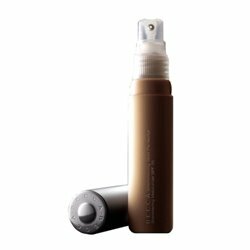 But I loved your idea of illuminating powders on hair, at first it seemed weird but it makes a lot of sense once you get over the putting make up on your locks…! In my opinion, Dior always has the most beautiful Christmas collections! These look stunning! 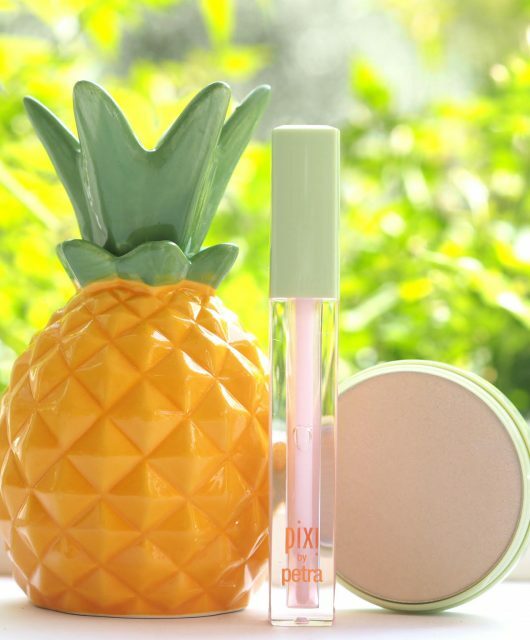 I’m not really big on sparkle make up wise, but I am dying to try that Mirror Fusion Mono! If you can’t wear sparkles at Christmas, when can you! Oh stunning! The illuminating powder might just be prettier than the Chanel’s to me. Plus, it’s at a friendlier price tag. I’m not going to lie: while I like the shades in the palette, I am quite disappointed that the deep plum shade is maroon. I was expecting a more berry toned plum. Quite sad, as the quint looks just stunning in the pan! OMG the colours are amazing!! Thanks for this post!! Geez, I’m saving my money for these now! Looks amazingly glamorous!